Sometimes, to see the whole picture, you need multiple views. 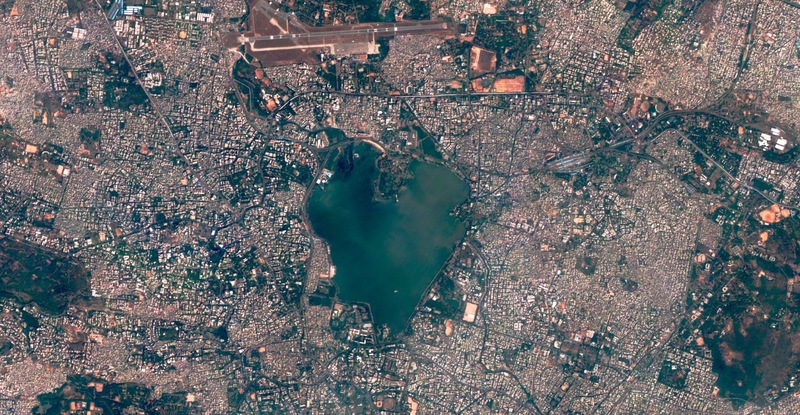 Seen below from three distinct space-based sensors, a quaint heart-shaped lake bisects twin cities, wrapped in a network of streets, including Necklace Road. But at street level, things get real. 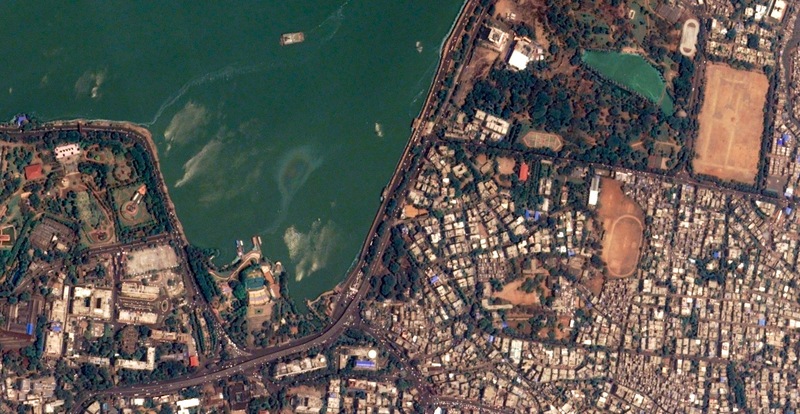 The 400-year-old Hussain Sagar is a manmade lake located in Hyderabad, Telangana, India, and it’s become a growing problem for municipal leaders amid increasing environmental concerns. Described in a 2004 scientific report to the National Institute’s Hydrology Society: “The toxic substances of particular interest are potentially toxic elements (PTEs), heavy metals and other trace elements, derived from urban runoff as well as industrial and municipal sewage effluents.” Fine particulate matter in the water can absorb those PTEs and settle on the lakebed. Over time, these can accumulate in the sediment, posing a risk to organisms and water quality. Enter, the engineers. With increased urbanization and the resultant pollution, the local government recently commissioned the Austrian Technology Institute (ATI) to solve the lake’s pollution woes; plans are still in the works, according to most recent news reports. Those pollution issues aside, one has to admit that anything heart-shaped is pretty charming, particularly when viewed from space. 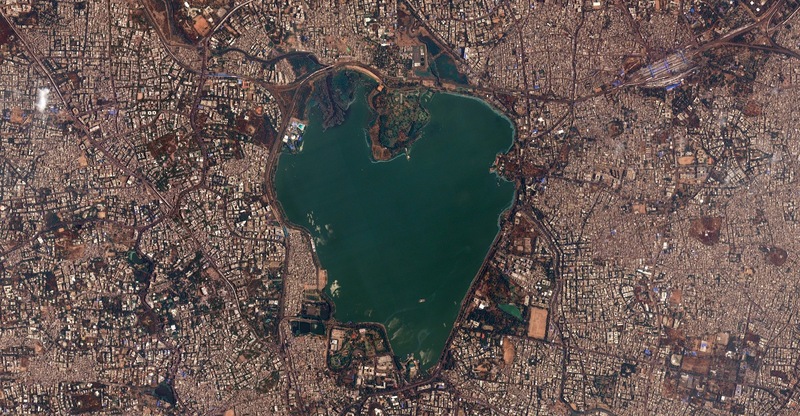 And with Valentine’s Day upon us, Hussain Sagar presents a great opportunity to highlight different Earth Observation sources, including NASA’s Landsat 8 imagery, which is available on the UrtheCast Platform along with Theia and Deimos-1 imagery. Hussain Sagar, Hyderabad, Telangana, India. Captured from UrtheCast’s Deimos-2 satellite. In the middle with Theia. Hussain Sagar, Hyderabad, Telangana, India. Captured from UrtheCast’s Theia camera aboard the International Space Station. 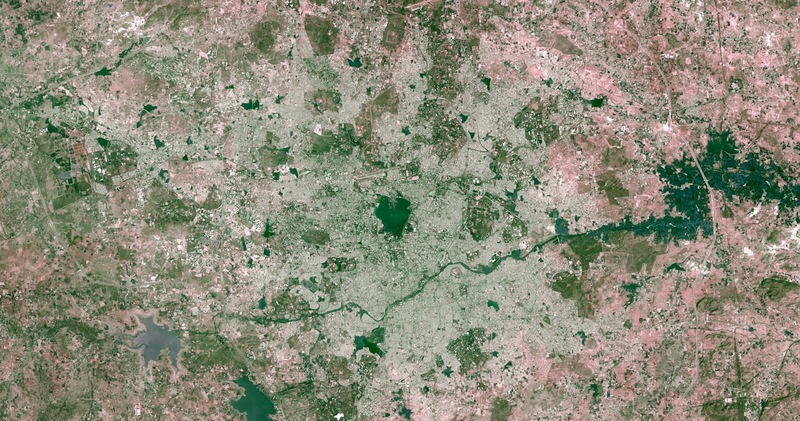 For some perspective, Landsat 8. Hussain Sagar, Hyderabad, Telangana, India. Captured from NASA’s Landsat 8 satellite.